At a press conference held in Malaga on the 4th of June 2010, the chairman of the Royal Collections Grouping’s General Assembly, Fulgencio Alcaraz, revealed that a cut citrine weighing 20,200 carats, the largest of its type in the world, is to be added the organisation’s ‘Special Exhibition Gems’ collection. The perfectly-cut oval gemstone measures 20x15x10 centimetres and is of exceptional purity, colour and transparency. The exhibit has been named ‘Malaga’ in an altruistic gesture of gratitude for the warm welcome received by the Art Natura culture and art complex run by the Programa Royal Collections grouping in this provincial capital. The ‘Malaga’ citrine is a unique specimen unlike any other to be found the world over. It is therefore impossible to place a monetary value on the gemstone, and no other museum or collection can boast a similar exhibit. The Mayor of Malaga, Francisco de la Torre, has expressed his gratitude to Royal Collections for naming this remarkable precious stone after the city, a move that will guarantee its presence in all of the international exhibitions and publications involving the gem, thus helping to put Malaga at the forefront of the cultural tourism sector. The gemstone itself, a veritable miracle of nature, was unearthed in a mine in the province of Governador Valadares, located in the Brazilian state of Minas Gerais. Though originally discovered in the late 1980s, it was not cut until 2009, when a team of Brazilian veterans took the difficult, risk-laden decision to perform said procedure. The mere commencement of this long and complex process results in the loss of the original mineral specimen, which in this case, given the nature and size of the stone in question, was of immense scientific and heritage value; at the same time, it is impossible to know beforehand whether or not the presence of inclusions or cracks inside the mineral will make it impossible for a high-quality gemstone to be obtained. The cutting was a resounding success, and in early 2010 the gem was moved to the vaults of Programa Royal Collections. This organisation, which is devoted to the creation and administration of cultural heritage exhibitions, boasts the largest collection of gemstones to be found anywhere in the world, comprising thousands of gems of every conceivable variety from all of the planet’s mining regions, an aggregate total of over 500,000 carats. The Programa Royal Collections gemstones are divided into three areas: the main exhibition, known as the “Royal Collection”, which comprises some 250,000 carats; the “Special Exhibition Gems” section, 24 gemstones that are unique in the world in terms of their size, purity and colour, adding up to a further 131,000 carats; and a series of monographic exhibitions focussing on specific types of gem. The “Malaga” citrine will now be added to the “Special Exhibition Gems” section, a collection which features other gemstones also acknowledged as the largest of their kind in the world, including the 31,000-carat imperial topaz ‘Eldorado’ and the ‘Star of Jaipur’, a 4,185-carat ruby. Some of the Programa Royal Collections exhibits will be on permanent display at Art Natura Malaga, whose inauguration is scheduled for the end of this year. As well as going on show in the city of Malaga, this large citrine will also feature in temporary exhibitions held in various capitals throughout the world. The ‘Malaga’ citrine is to go on display to the public for the very first time. No other museum or collection can boast a stone to rival this oval-cut gem, the largest of its kind in the world. Weighing 20,200 carats and measuring 25x15x10 centimetres, the gemstone has been named after the city that is home to the headquarters of Art Natura, where it will be placed on permanent display. The mineral from which this magnificent citrine was cut was discovered in 1990 in a mine in the Governador Valadares area of the state of Minas Gerais, Brazil. It remained uncut until 2009, when a team of veteran cutters was formed. The decision to cut a stone inevitably carries with it a series of major risks: the mere act of cutting itself results in the loss of the rough crystal which, in this particular case, was of immense scientific value, given the stone’s characteristics; at the same time, it is impossible to know whether or not the condition of the inner crystal -which may present inclusions or cracks- will be conducive to producing a gem of significant size and quality. In addition, cutting gems is a far longer and more complex process when large stones are involved rather than their commercial-sized counterparts. To do so successfully requires expert cutters, special techniques and even, on occasions such as this, custom-built machinery, and the procedure is never completely free of the risk of breakage or other occurrences that may endanger the precious stone. 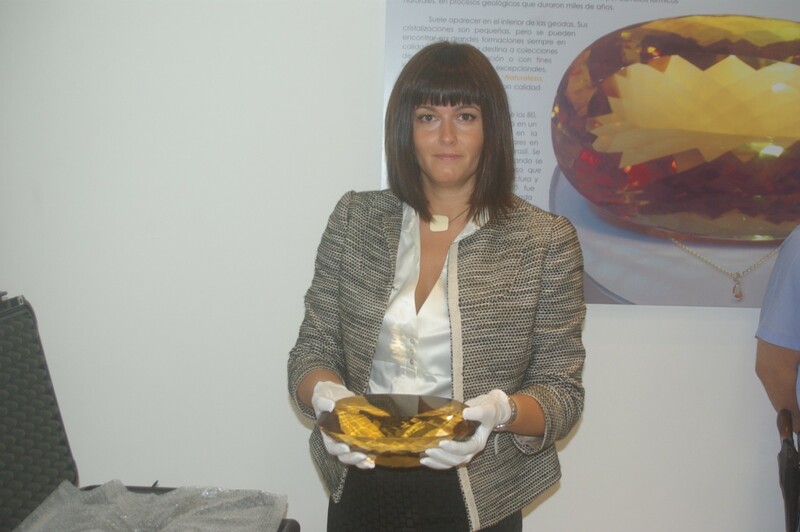 In 2010, the citrine was brought to Spain to join the huge assembly of precious stones exhibited by Programa Royal Collections, the largest in the world. Prior to this, the biggest citrine owned by said organisation had been the ‘Sol del Sur’ (Southern Sun), an extraordinary 8,200-carat, oval-cut stone which is part of Programa Royal Collections’ special exhibition gems section. This collection also features another large citrine, ‘Soledade’ (Solitude), an emerald-cut stone weighing 6,705 carats. This same variety of gem is also featured in a monographic collection entitled ‘All about citrine’, which boasts a wide range of stones of varying origins, sizes, cuts and tonalities. Citrine is a sister gem to amethyst. Both belong to the quartz family of stones, though they differ in colour, amethyst ranging from violet to purple and citrine from lemon yellow to orange yellow. Citrine is usually found inside geodes, and in such cases it features small crystallisations just millimetres or a few centimetres in height. The best colours are to be found near the tips of the stone, which are cut for use in jewellery. However, citrine may also occasionally be encountered in larger formations weighing tens of kilograms, though the mineral quality of such stones is insufficient for them to be considered gems. The latter variety is displayed in mineralogy collections or turned into decorative items, as well as serving a multitude of industrial purposes which include use in high technology. It is extremely rare for a large citrine to exhibit the exceptional transparency and colour required for the stone to be cut into a gem. The stone’s name comes from the Latin citrus, meaning lemon, an allusion to its yellow colour. After feldspar, quartz is the most commonly-found mineral in the Earth’s crust. However, citrine is a gem rarely produced by nature. For this reason, most of the citrine sold on the market is really heat-treated amethyst or smoky quartz. Those citrines whose colours have been obtained artificially tend to exhibit a more orange or reddish tonality than their natural counterparts. In some cases, amethyst becomes totally or partially transformed into citrine due to natural thermal changes that are part of a geological process lasting thousands of years. Given that most citrines are formed by heat, jewels that include these gems cannot be exposed to direct sunlight or displayed in high temperatures. • Colour: yellow, yellowish brown, dark orange brown or reddish brown. • Transparency: transparent to translucent. • Optical properties and refractive index: uniaxial (+); 1.544-1.553. • Similar gems: topaz, tourmaline and beryl. • Main deposits: most citrines come from Rio Grande do Sul, Minas Gerais and other states in Brazil. Other countries in which they are also to be found include Russia (the Ural Mountains), Bolivia, Paraguay, Madagascar and the USA.